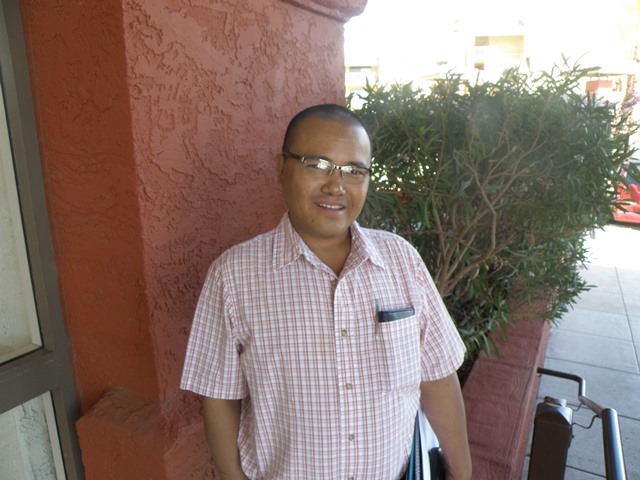 To say that Shakta Man Ghale came a long way to attend Grand Canyon University’s College of Doctoral Studies residency this week tells only 18 hours of the story. Fasten your seat belt. This will be a wild ride. 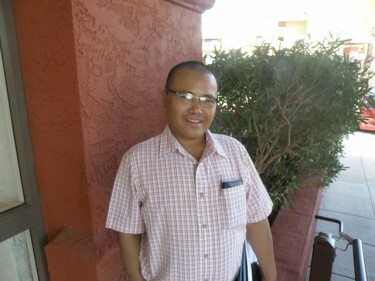 Ghale, GCU’s first international doctoral learner, traveled from Nepal, situated in the Himalayas northeast of India, to Qatar, then to Philadelphia, then to Louisville, Ky., to visit his sponsors at the Bethel Christian Center in Rockport, Ind., and finally to Phoenix to be at the Pointe Hilton Squaw Peak Resort with 208 other learners. But his journey to reach this point in his life is far more involved than mere air travel. Let’s start at the top. That aptly describes where people live in the village of Barpak, where the 41-year-old Ghale (his full name is pronounced SHOCK-tah mahn GAHL-ee) grew up. Top, as in the top of a mountain, more than 6,000 feet above sea level. Look up Barpak on the Internet and you’ll see pictures of huts and shacks so close together, they almost seem like one continuous building atop a narrow ridge. There is no electricity there. No plumbing. No schools. No hospitals. When you need to get somewhere, you walk, usually for days. The crop, in fields plowed by water buffaloes, comes in once a year and feeds the people for a couple of months. The rest of the time, they forage for food. About half of the children die by age 5. “People are living like it’s the Stone Age. Maybe in 2,000 years they’ll live like the U.S,” Ghale says, smiling. English is his third language, after the native tongue of his home area and Nepali, and he speaks remarkably well. Even after his long trip, he is engaging and animated. Shakta was 7 when he was wracked by complications from tuberculosis that caused an obstruction in his intestines so severe, his belly was the size of a basketball and his legs were more like sticks. Terrified, his parents walked four days to bring him to Dr. Tom Hale Jr., who did missionary work in the country from 1970 to 1996 with his wife, Dr. Cynthia Hale, and worked at a small hospital in the Himalayan village of Amppipal, 100 miles northwest of the capital, Kathmandu. The diagnosis was grim. His chances of living even with the surgery were remote. Permission to operate came not from Shakta’s father, who had to leave right away to return home, or his mother, who did not speak Nepali. Instead, it came from Shakta himself. Tom says the three-hour procedure was among the most complicated he ever did there, and that wasn’t his only concern. “If you lose a patient like that with a population that doesn’t understand modern medicine, many, many people who have much more curable diseases will be afraid to get treatment,” he says. To make matters worse, Shakta has a rare blood type, and the hospital didn’t have any in supply. His only hope was Dr. Helen Huston, whose O-negative is a universal red cell donor blood type. She had gone to Sunday services and to visit with a friend but felt a tug to return early. “Going back, I had a feeling I was needed at the hospital, so I walked up the hill as fast as I could,” she says. Huston made it in time to get Ghale the blood transfusions he desperately needed. Christians there have been routinely persecuted, and Phillips says that when he first entered the country he was warned by authorities that preaching Christianity was prohibited. The country declared itself a secular state in 2006, and a new constitution in 2007 guarantees some religious freedoms but forbids trying to convert anyone. Phillips, who says it came to him in prayer that he should focus his missionary work on Nepal, talks excitedly about what he has seen there. Prayers for healing are routinely answered, and as word of those miracles spreads whole villages are converted — he doesn’t even need to preach. He says pastors come from every sector of the population of 27 million. Some are even former witch doctors. But there’s a long, long way to go, and that’s where Ghale’s mission comes in. Phillips met him on a mission trip into the mountains and quickly was taken by Shakta’s determination, as by far the most learned man in the region, to help his people. He already has a master’s in business administration from Virginia International University in Washington, D.C., and his doctorate at GCU will be in business administration with an emphasis in management. He faces considerable obstacles, including a government still in transition even though it has been six years since King Gyanendra was deposed, ending nearly 2½ centuries of Hindu monarchy. He says Chinese Mafia have infiltrated the country and pose a considerable threat. The obstacles don’t stop there. Although Kathmandu, where Ghale lives, is a city of nearly one million, most of the people have electricity for only about 10 hours a day. There are hundreds of castes in the country, and only the most elite have power full time. And then there’s the question of how he’s going to do his field research up in those powerless mountains. Doctorate courses come one after another, and Ghale, who wound up in the GCU program after he just happened to see it on the Internet, will need a special dispensation for the times when he doesn’t have Internet access. Conaway, who says there are two Nepalese undergraduate students on campus, had to coordinate Ghale’s trip with the Department of Homeland Security and then welcomed Shakta when he arrived Monday afternoon. How selfless is he? This much: Phillips says he gave Ghale $300 for food for the trip from Nepal to Louisville. When Ghale arrived, the pastor asked him, just out of curiosity, how much he had spent. The answer: $9.25. Ghale intends to take his work far beyond Barpak. He talks of bringing aid to similarly constructed villages in the Himalayas that are 16,000 feet above sea level, where people gather in groups around fires to try to ward off the cold. “You go there and you will see how people are fighting just to survive,” he says. Spoken like someone who’s a true survivor himself.